On the eve of Zipcar’s IPO, with profitability riding on driving down the cost of their fleet of designed to be owned cars, it’s time to ask whether products should be designed to be shared. Zipcar has shown that running a car-sharing business with traditional cars isn’t cheap. They’re the market leader with roughly 500,000 car sharing members, most of whom express zealous enthusiasm toward the Zipcar brand and experience. They’ve made car sharing aspirational and fun. With $186 million in revenue last year and membership booming, it’s hard to imagine they wouldn’t also be profitable. But, in fact, they’ve never turned a profit. And they’re over $65 million in debt. When you look closer at the cost of providing the Zipcar experience, their debt makes more sense. The better part of its 8,000-car fleet is leased, and their high cost of operation is due mainly to the cost of the cars. Further, these expensive and high-maintenance vehicles are being turned over every two to three years. Sometime this week, Zipcar is expected to go public in a $75 million initial offering. According to its regulatory filing, Zipcar will use the funding to help with general expenses and pay off debt. However, the company cautioned that they expect a loss in 2011 and couldn’t predict when they would begin to turn a profit. The interstate system has another quality besides the creation of corridors, boundaries and districts: it orders and grids the country. In creating the basic numbering plan for the highways, its creators followed a tradition that includes not only previous highway systems (including the 1920’s U.S. Highway System), but street layouts dating back to William Penn’s Philadelphia, the initial “nine squares” of New Haven, and the very definition of United States territory, the 1785 Land Ordnance with its grid of 6 x 6 mile townships. It has become so common for American cities to lay out streets in a square grid with numerical names that it can be surprising to go to countries where this practice is unknown. Learning to navigate even older American cities like Boston, where what grids there are are haphazard and streets change names seemingly at whim, can be daunting to those raised in orderly Omaha or Chicago. One roadway = one line. Two-digit routes would be drawn with a heavier line weight than three-digit routes. Where they share a pathway, the heavier line takes priority. State boundaries would be topologically correct: every road intersection and state boundary road crossing would be shown in the correct order. Odd-prefix three-digit routes (i.e spurs like I-394) would be shown as straight lines, and even ones (i.e. loop roads like I-494/694) would be made of circular arcs. 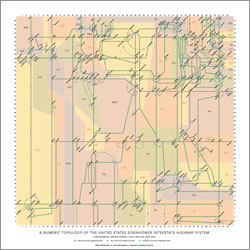 As much as graphically feasible, routes would be encouraged to lie along their numbered place in the grid for as much of their length as was graphically feasible. A minimum of 1⁄4 inch would fall between each major intersection. Mostly. I would use only straight line segments and arcs. No other curvy bits.